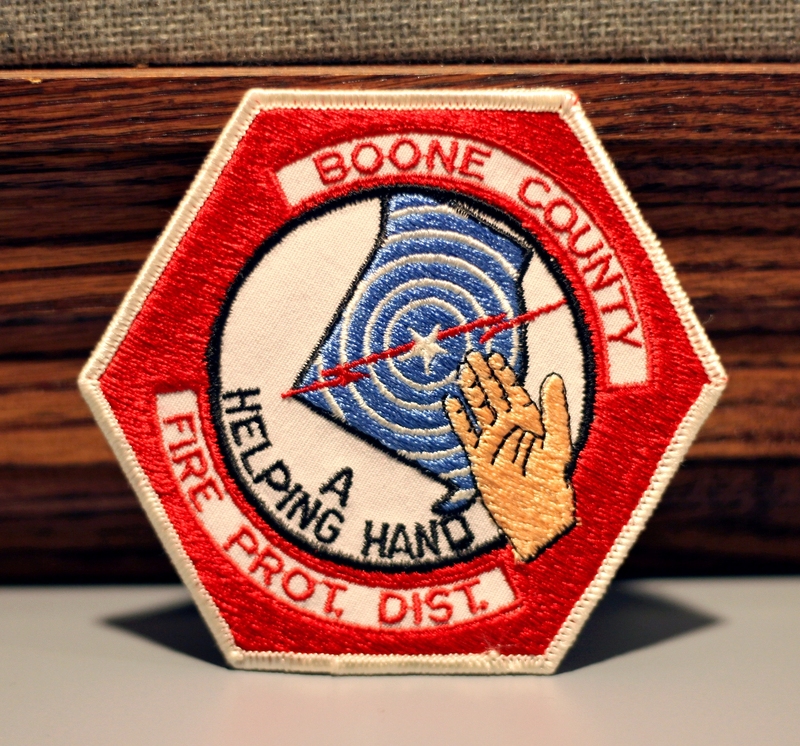 Boone County Fire Protection District: A Helping Hand. In the early 60’s, just west of Columbia, there was a fire that claimed the house and life of an old woman. At the time, there was no official fire protection outside the city of Columbia, People were taking notice, and people wanted to help. It was a group of CB radio enthusiasts who endured the agony of the situation, unable to provide qualified help, and became determined to offer fire and rescue protection to the citizens outside the city limits. Pat Barnes, one of the founders of the Boone County Fire Protection District, was one of these CB enthusiasts. He gathered others and together they formed the Central Missouri Radio Squad, which later became the Boone County Volunteer Fire Department. In 1970, by a citizens’ vote, the Boone County Fire Protection District was officially formed. The original Fire District uniform patch displays the motto: A Helping Hand. After extensive, creative fundraising, a fire truck was purchased, equipment donated and it was all stored in a chicken coop. The group was comprised of very influential people who begged, borrowed and took from their own pocket for whatever was needed. “They acted in the true volunteer spirit giving not only time but their own money,” commented Scott Olsen, the current Fire Chief. The Fire District has continued to grow since the 70’s, holding strong to their motto: A Helping Hand. The Boone County Fire Protection District is the 3rd largest traditional fire department in the state, only to be out-ranked by St. Louis and Kansas City. With 14 fire stations throughout the county, the Boone County Fire Protection District is the largest volunteer fire department in Missouri with 421 total members, of which 265 are volunteer fire fighters. The primary services the Fire District provides are: Fire Rescue, EMS and HAZMAT (hazardous materials) protection. Roughly 80 percent of calls are EMS related, 20 percent fire and rescue. The 14 stations receive, on average, 4,200-4,400 calls a year, or approximately 12 calls a day. The busiest is Station #5, near Prathersville Rd. and Hwy 63, taking about one-fourth of all calls. In addition to the traditional fire department services, the Fire District also provides local public education to most schools in Boone County. Survival Kids, as an example, is a preventative educational tool for 4th graders about life safety. “Preventative services is a big part of what we do. If we can save someone from getting into trouble that supports our mission,” explained Fire Chief Scott Olsen. 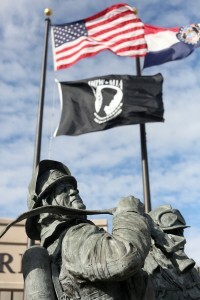 The statue displayed proudly in front of the Fire District illustrates its brave heroes. When Chief Olsen was asked what sets the Boone County Fire Protection District apart from other fire departments, he shared a story from last Thanksgiving. A call came in about a home fire; the element in the oven had broken while a family was preparing their Thanksgiving dinner. The volunteers extinguished the fire, rendering the kitchen useless. The volunteers took the women of the family and the uncooked food to the station kitchen where the ladies finished preparing the meal then returned home to continue on with their traditions. The volunteers at the Fire District take that extra step with their rescues. They help citizens involved in accidents get home, get their car fixed or help with squaring away insurance issues. Often the accidents which occur on I-70 and Hwy 63 involve out-of-towners. The Fire District volunteers are happy to assist in any way to ensure the people get safely back home. Within the Boone County Fire Protection District is Missouri Task Force 1, a smaller team of volunteers who have undergone extensive training in Urban Search and Rescue, emergency or disaster situations. Members of MO-TF1 are the volunteers who are often deployed around the country offering services from large-scale damage disasters to reinforced concrete rescues to recent involvement with wide area search-and-rescues after hurricanes or other natural disasters. The first MO-TF1 deployment was on 9/11. Since then, these fire fighters have been deployed to Joplin, MO, after the catastrophic tornado, New Orleans for Hurricane Katrina, Northeast for Hurricane Sandy, Colorado for wildfires and more. The national system is managed out of Boise, ID where they coordinate with state agencies to find where Task Force volunteers are available. 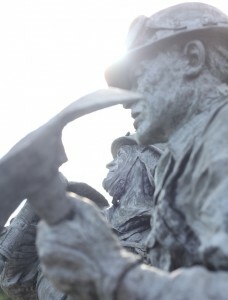 Often they receive 12-24 hours’ notice before being deployed on a possible two-week assignment. While this prohibits the volunteers from any sort of set schedule, depending upon whether their deployment is Federal or State, there is a possibility of financial compensation. Though it certainly is not a requirement for the fire fighters to live at a station, residency rooms are available and more often student volunteers find this option appealing. The Fire District has 63 residence rooms across 13 stations offering room and board in exchange for more on-call time. The volunteers are given opportunity to save money while providing a much faster response time from the station in which they reside. At the heart of all these fire fighters, and those who help out in any form, is courage, strength and compassion. Tranquility General Manager Travis Schumacher stands next to Fire Chief Scott Olsen and IT Manager Lee Turner at the Boone County Fire Protection District Headquarters. Maintaining and operating a successful fire department consisting of 14 stations is not an easy task. There is constant communication from station to station, a station to headquarters, a station to those out in the field and dispatching. When even the fewest of seconds can prove critical, information needs to get where it’s going and quickly. 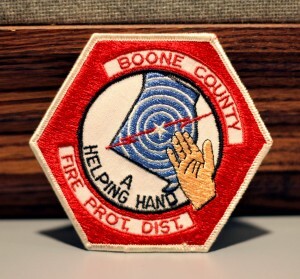 In 2000, the Boone County Fire Protection District received a grant to install computers in each of the 14 fire stations, providing a solid network of communication through a Frame Relay Line, or a connection over a wide area network. The computer vendor suggested Tranquility for their set-up, Leon Schumacher, founder of Tranquility Internet Services, Inc., came out and their excellent business relationship began. Shortly after the initial computer network set-up, the Fire District moved from their previous Internet provider, hired Lee Turner as their in-house IT and switched solely to Tranquility for all their Internet needs. The Frame Relay Line served well in the beginning, but the Fire District needed more. After some time, the FRL was replaced by Tranquility’s DSL in all of the fire stations and a Fiber connection was later installed at Headquarters. The high-speed connection has provided the volunteers the opportunity to view numerous training videos and other helpful materials uploaded by the Fire District. It has opened doors for information on a national level, allowing the volunteers to attend conferences otherwise unattainable. The members can easily, and quickly, interact through web conferencing, webinars and other training websites. Some of the task force members live all over Missouri proving it difficult to always attend important meetings. With the help of Tranquility, those unable to attend can easily sign on and join in through video conferencing with a smooth connection. To the Fire District, a volunteer’s time and hard work is invaluable. Striving to create a comfortable environment while volunteers are at the station awaiting a call, several of the fire stations have two DSL lines. One DSL which is strictly connected to Headquarters for dispatching, and another connection for the volunteers to use freely for, say, video games. In addition to Fiber Internet and DSL services, Tranquility provides Google Apps support. “We have people addicted to Google Apps,” said Lee Turner, Fire District lieutenant and IT manager. Currently supporting 450 Google Apps users, there is obvious truth to that statement! Before Google Apps, the Drive feature in particular, Lee would have to waste time emailing documents back and forth with various people. With Google Drive, a document can be created or uploaded, shared, and viewed immediately. When a document is shared, several parties can edit the document, simultaneously, if needed. On a monthly average, 500 new documents are uploaded to the Fire District’s Google Drive. When Missouri Task Force 1 is deployed, there are certain documents needed throughout deployment. With Google Drive, it’s easy to share documents across the country. Missouri Task Force 1 was deployed to Colorado and was in need of certain documents located back in Missouri. The documents were uploaded to the Drive and immediate feedback ensued. “The structure of our network is in a document,” exclaimed Lee. 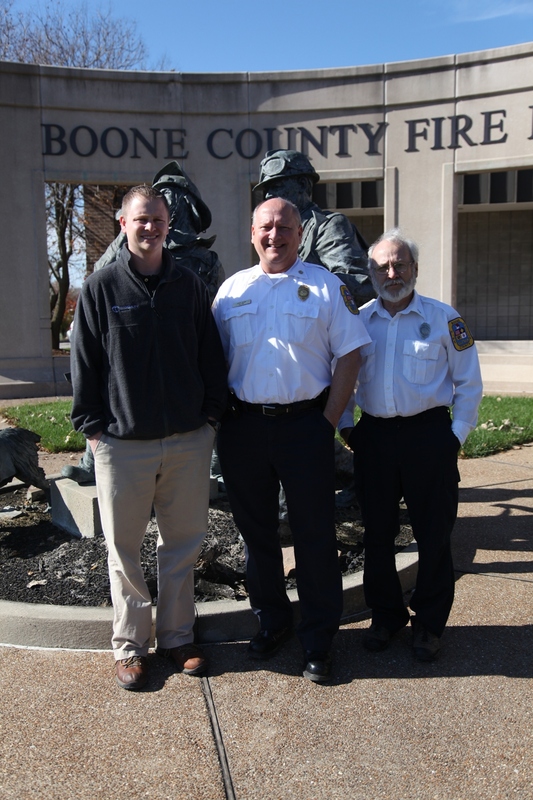 After 13 years of doing business together, the relationship between Tranquility and the Boone County Fire Protection District continually proves a successful one. Tranquility continues to proudly support the Boone County Fire Protection District, and the Fire District valiantly supports the community. In the early 60’s, just west of Columbia a fire claimed the house and life of an old woman. At the time, there was no official fire protection outside the Columbia city limits and people were taking notice, and people wanted to help. It was a group of CB radio enthusiasts who endured the agony of the situation, unable to provide qualified help that became determined to offer fire and rescue protection to citizens outside the Columbia city limits. Pat Barnes, one of the founders of the Boone County Fire Protection District, was one of those CB enthusiasts. He gathered others and together they formed the Central Missouri Radio Squad, which later became the Boone County Volunteer Fire Department. In 1970, by a citizens vote, the Boone County Fire Protection District was officially formed.